An intentional community working to translate Gandhian ideals of living into action and to promote a life of simplicity (which also implies sustainability and care for our environment), self-sufficiency and service to the community. Thus while ahimsa (nonviolence), satya (truth) and karuna (compassion and, by extension, universal brotherhood) are its guiding principles, in practice it is swadeshi (self-sufficiency) that shapes the Ashram’s economic and productive activities. Founded in the late 70ties by Mrs. Gedong Bagoes Oka as “Ashram Gandhi Çanti Dasa” (Servant of Peace?). It host 7 cottages (bale), which supplies the main funds of maintaining the ashram and give educational support to its members. 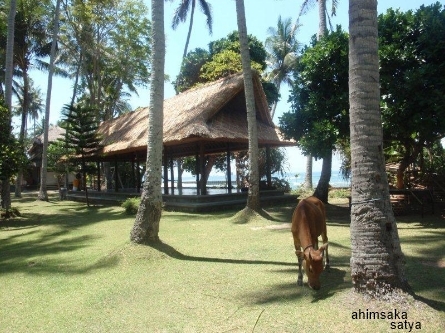 The bale yoga is an open space with a thatched roof and an amazing ocean view were daily yoga sessions take place for the members, ashram guests, and every one that likes to join. Focus of the classes is the general well being of body & mind.